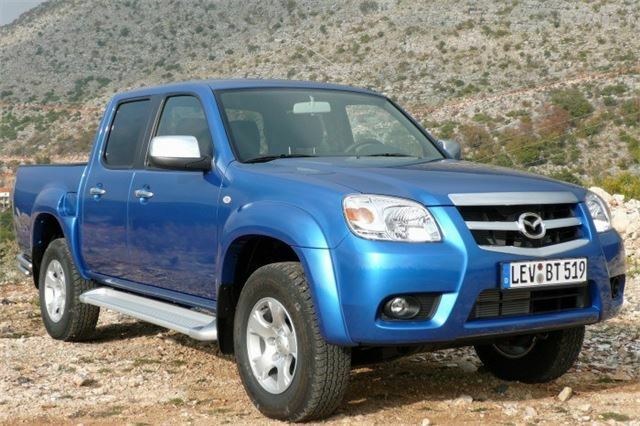 The Mazda BT-50 pick up, originally launched in 2006, has just had an upgrade, with the new option of a 3.0 litre engine and 5-speed automatic transmission for the UK. So, a good time for a road test. 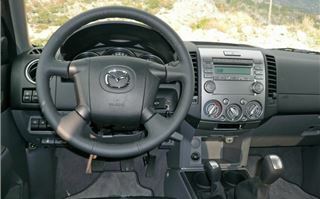 Interiors now feature nicer upholstery, pleasant amber lighting for the switches and an AUX jack for the audio system. Outside there’s a new grille, new lights front and rear and new colours. 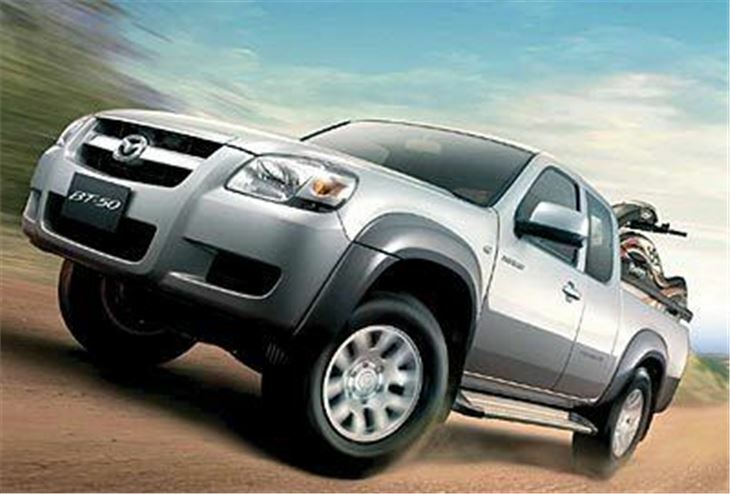 The 4x4s can all tow 3,000kg braked, and have an impressive load capacity of 1,219kg. 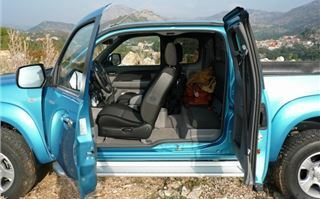 The UK doesn’t get the ‘Freestyle’ 2+2 cab, the first cab of its type with pillarless rear-hinged rear doors for the simple reason they don’t sell well enough. 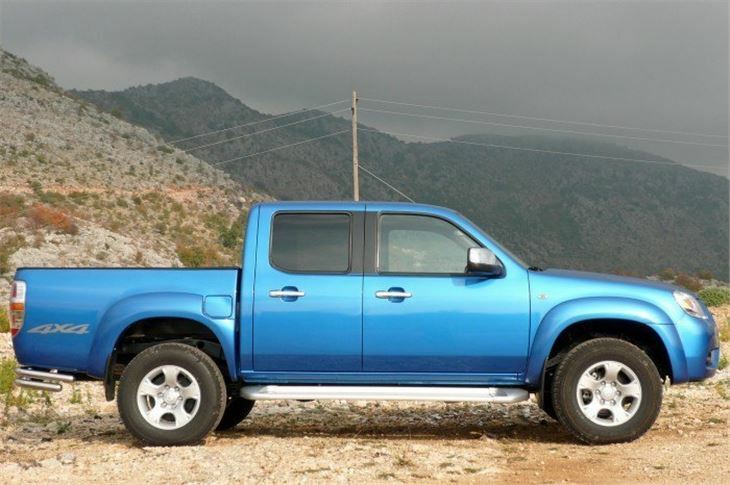 But we do get the 2WD or 4WD single cab and the 4WD double cab, the latter with a 143PS 2.5 engine and 5-speed manual box, or the new 156PS 3.0 engine coupled to a 5-speed automatic box (unfortunately, not available for testing). Sales of all pick-ups in the UK have been hit by removal of the BIK tax advantage they used to enjoy that made them much cheaper for company drivers than a car. To ease this pain slightly, particularly for small limited companies, Mazda UK has cut prices from October until the end of December 2008 by as much as £1,981 before VAT. 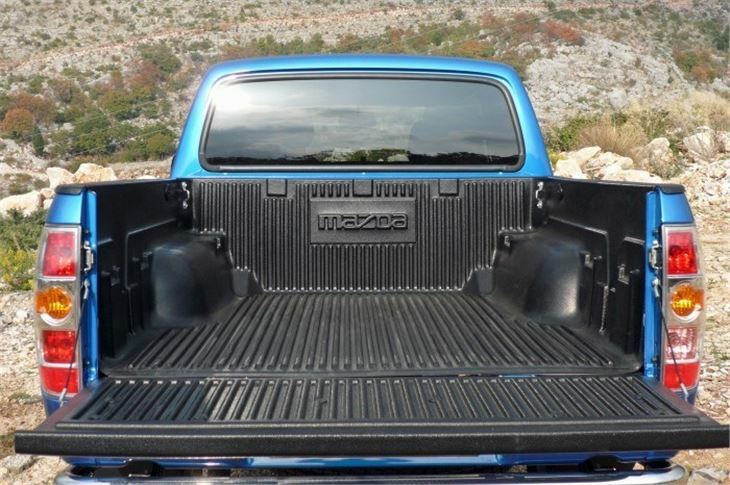 No point in repeating the specification details you can read further down, so we’ll get straight into the road test. My benchmark for pick-ups is our own Isuzu D-Max hi-lander 2.5 I-TEQ that we run at the farm in Thailand. That’s basically a 2WD D-Max on stilts that offers a high driving position at the expense of an equally high centre of gravity. But it has a really nice, sweet power delivery and an excellent, slick 5-speed manual box that makes it very pleasant to drive. It’s also astonishingly economical, delivering more than 36mpg on a fast 450mile run from Detudom to Bangkok. Ride isn’t great, though. And on the one occasion I loaded it with the proverbial ton of bricks, plus a couple of hundredweight of cement I had to take things very carefully. It’s a bit difficult trying to film and road test a new vehicle for the first time. You can end up filming first, then changing your mind and having to film again. As I did. First impressions of the motor were not impressive. 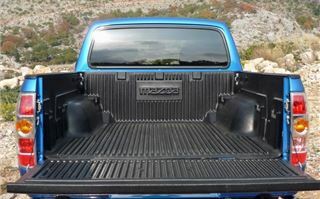 It seemed to lack the lovely ambling low down torque of out D-Max. But on second acquaintance, in a different BT-50, I found trickling down to a tractor-like 1,000rpm in 5th, then pulling strongly from 1,400rpm, so it’s okay. And, as long as you drive it like a truck, the handling is fine. The problems come if you try to drive it quickly, like a car. It doesn’t take kindly to changes of direction and the steering goes disconcertingly light. But find its limits and then drive it within them and you’ll be fine. It’s a shame you can’t buy the Freestyle cab in the UK because that would be my choice. There’s enough room in the back for a couple of people. The seat cushions fold up so you don’t get dirt all over them locking your pneumatic drill or whatever in there. And it gives the load deck a useful extra 223mm length. Annoyingly, like all 2WD pick-ups in the UK, the quickest BT-50 is limited to 50mph on UK A-Roads, so its lower stance, better handling and top speed of 105mph are less relevant than its slightly better acceleration. But the 4WD, which is allowed to do 60 on UK A Roads because it’s classed as a ‘dual purpose vehicle’, is quick enough for its chassis. Though, as you can see from the figures, there’s both a performance and fuel economy penalty for taking the automatic route, but some people just like automatics and, of course, there’s no strain on the clutch and dual mass flywheel when you’re towing with an automatic. For business and commercial towers, all new BT-50s are compatible with digital tacographs. 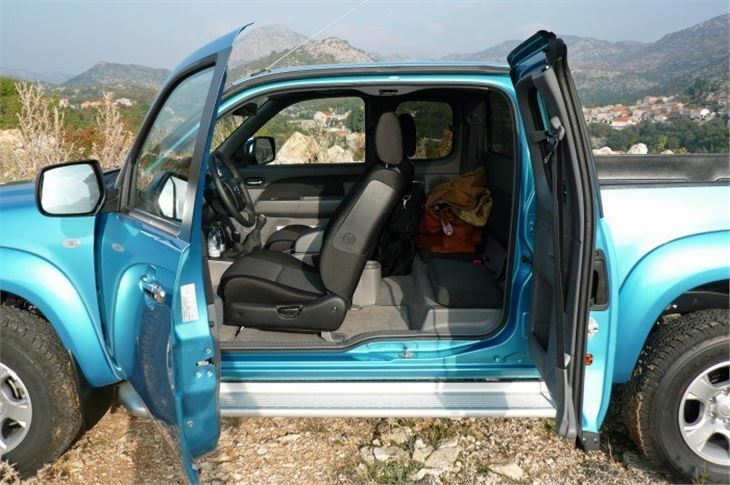 Inside, whether in the four-door, 5-seat double cab or the 4-seat Freestyle cab, you’re treated to decent shaped seats, height adjustable steering wheel, instruments that are nice to look at and, by virtue of its umbrella handbrake, a useful double compartment centre storage box. There are can or bottle holders in the door pocket and the centre console ahead of the gearlever, and, strangely, a fifth can holder in a well on the console behind the gear lever. 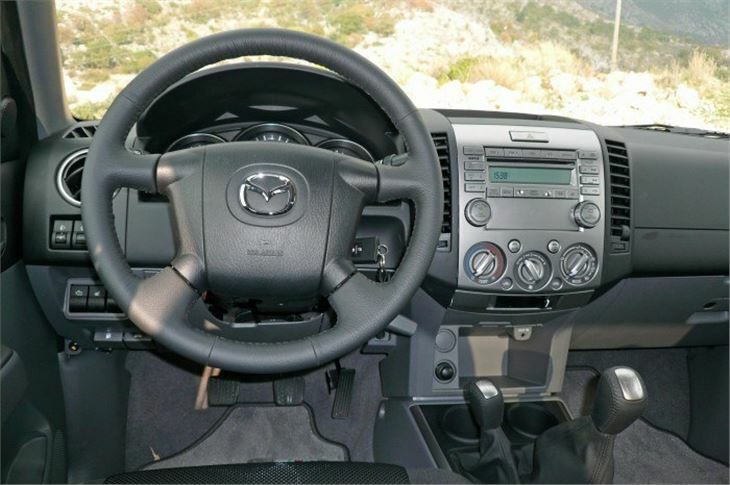 Not that Mazda is expecting drivers to get hot under the collar. The a/c works very well, though the condenser for it looks a bit vulnerable slung low down in front of the radiator. Time to search out an accessory stoneguard, perhaps, from the aftermarket manufacturers in Thailand. Back in 2006 the BT-50 was a huge improvement over the old B-2500. The latest improvements make it better still. 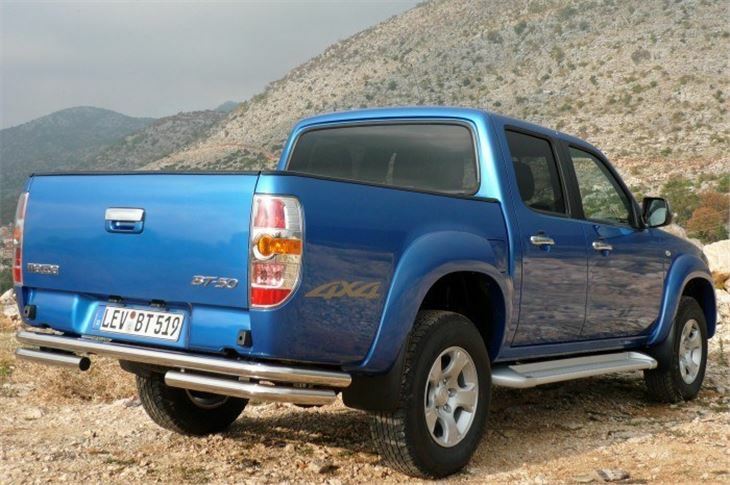 Every pick-up driver has his favourite, but there’s definitely no reason to consider the BT-50 an also-ran. And at the October to December special offer prices, it’s also a bit of a bargain.